Injured Suarez to miss China Cup for Uruguay – Royal Times of Nigeria. 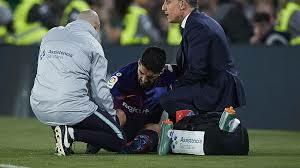 Barcelona forward Luis Suarez has been ruled out of playing in the China Cup with Uruguay after spraining his ankle for his club at the weekend. 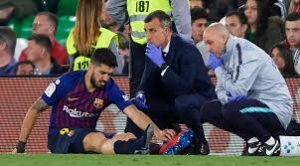 The thirty-two-year-old is expected to miss between 10 and 15 days after limping off late in Sunday’s 4-1 win at Real Betis in La Liga. Suarez’s absence adds to that of Edinson Cavani for Uruguay after the Paris Saint-Germain striker failed to shake off a thigh injury for the trip to China. Oscar Tabarez’s squad travel to Nanning to take on take on Uzbekistan on March 21, with the winner meeting China or Thailand in the final four days later. Suarez scored his 18th league goal of the season at Betis to draw level with Diego Forlan for the most goals scored by a Uruguayan in Spain’s top flight with 128.